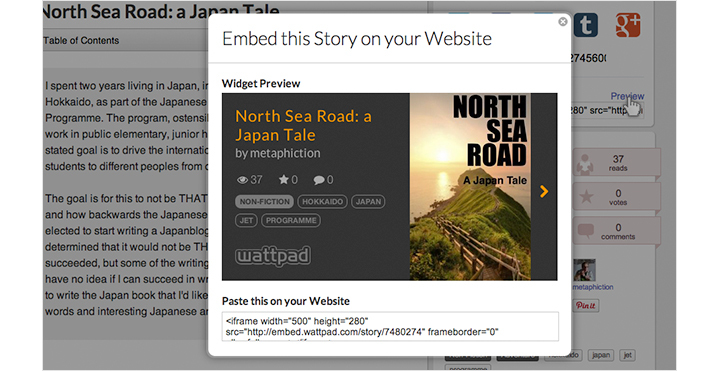 We recently introduced an exciting new way to share the Wattpad stories you love: the Wattpad Story Widget! This widget allows you to more easily share stories on your blog, Tumblr, or other websites by embedding the first story part. The widget’s clean, simple design lets users get a snapshot of a story before they get right to reading it. The main screen in the widget captures all of the pertinent information about the story that has been embedded: title, story cover, writer, reads, votes, comments, genre, and tags. When you click on the arrow on the right side of the widget, the screen slides over to reveal the story description and text from the first part. In this view, the reader can scroll down through the entire story part within the embed window. When they reach the end and want to continue reading, they can click the "Continue reading on Wattpad" button. Anyone can access the story widget by clicking the “Share” button to the right of a story part. ...you can see exactly how the Story Widget will appear when it is embedded in the content of your site. To embed the story widget, simply select the code from the Embed bar or from the bottom of the Widget Preview window, and copy-and-paste it into the content of your blog, Tumblr, or website. The widget works best in modern browsers like Chrome, Firefox and IE9+. Try it out on one of your own stories and start spreading your words!